Just Listed almost $20k under assessment value!!! Welcome to country living at its finest. 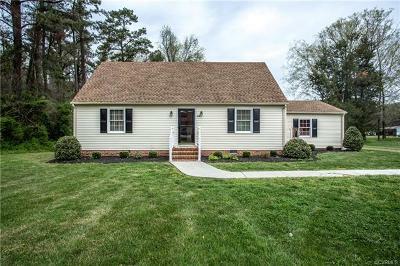 This well-built 4 bedroom, 2 bath Cape style home with a full acre lot is located in a quiet, family-oriented neighborhood. This home has been power washed, freshly painted throughout, and has all new light fixtures and updated hardware. Enter your open Family and Dining room with plenty of space for entertaining and family time. The kitchen has been updated with all new laminate floors, countertops and freshly painted cabinets. Down the hall are two large bedrooms and a full bathroom, perfect for a growing family or guests that may need downstairs space. Rounding out the first floor is a oversized Florida Room overlooking your newly painted deck and large private back yard. Upstairs you'll find your master bedroom, fourth bedroom, full hall bathroom, and access to your walk-in attic. This home is conveniently located off rte 10, and only a short distance from great local shopping and restaurants. This house is move in ready and awaits its new owner! Directions: Va 10e To State Rte 610/State Rte 646. Turn L, Home Will Be On The Left.